Tutorials: We are here to help! Try frevvo today! FREE 30-day trial. frevvo offers many tutorials to guide you through each step of the way when it comes to building the perfect form and or workflow. Read instructions, watch videos, follow along and do it yourself. Stuck on a specific step? Look through our list of tutorials and start there. If you are new to frevvo start from the beginning and let us show you the way. Several step by step instructions feature images so you can see where you should be by this step. You will quickly understand what to do with your new product. 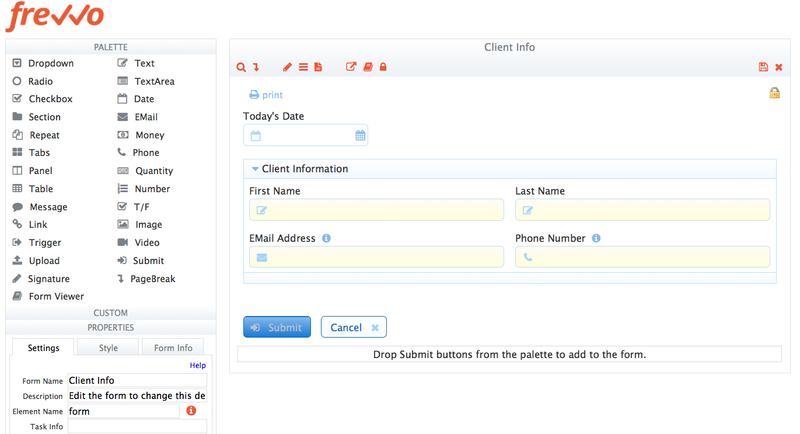 Database Connector Tutorial — With Live Forms, you can create dynamic forms that connect to your database, populate controls from the database, update drop down controls dynamically etc. This Tutorial works through several examples demonstrating various features.